After graduating from the Ontario College of Art and Design in Toronto, Canada and working for several years in commercial art studios in Canada and the US, I moved to Ireland, and spent over 30 years working as a natural history illustrator and book designer. For a number of years, whilst freelancing, I taught art part-time at a local secondary school. In 2004, I wrote and published, with my husband, a popular field guide, 'Connemara Wild Flowers'. 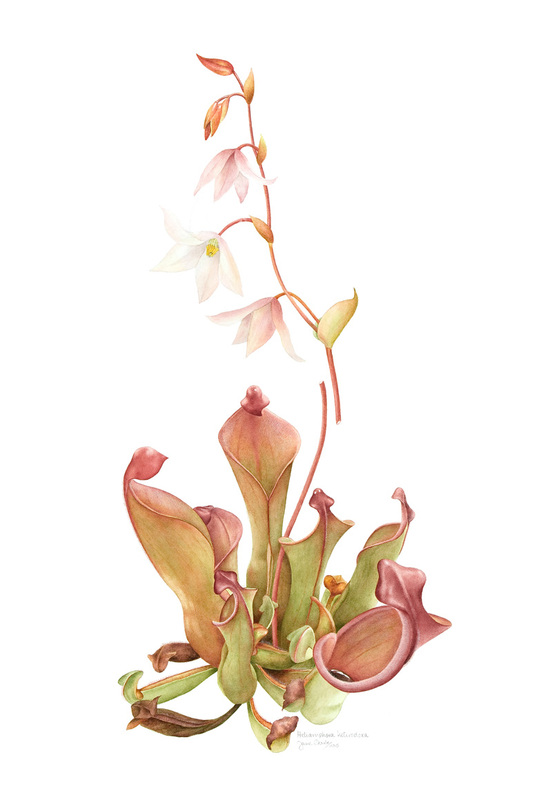 An early interest in painting highly detailed miniatures, combined with a knowledge and love of all forms of plantlife, eventually led me to specialise in botanical art. 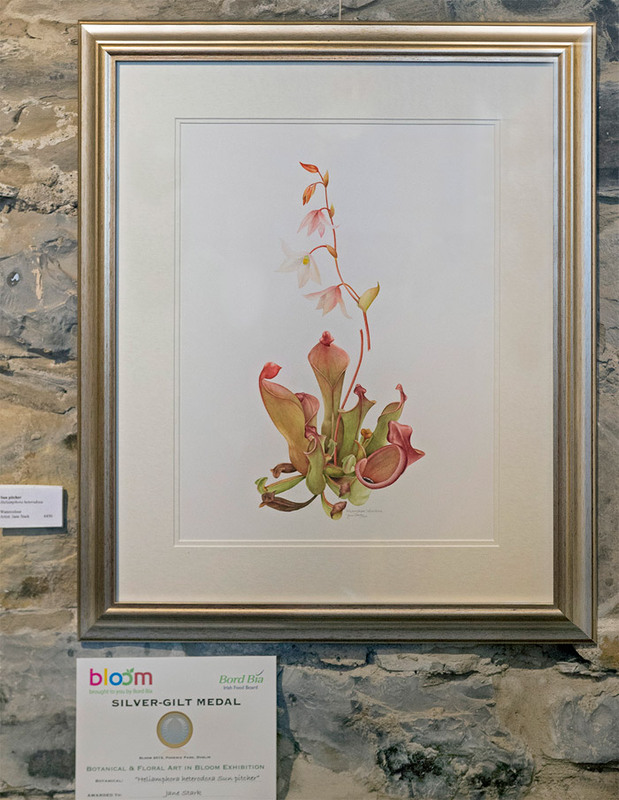 In addition to painting both wild and cultivated plants, I curate the annual Claregalway Botanical Art Expo at Claregalway Castle, am presently Communications Officer for the Irish Society of Botanical Artists, and I run botanical painting courses and workshops in the west of Ireland. Her work hangs in collections in Ireland, Canada, the USA and the Netherlands. 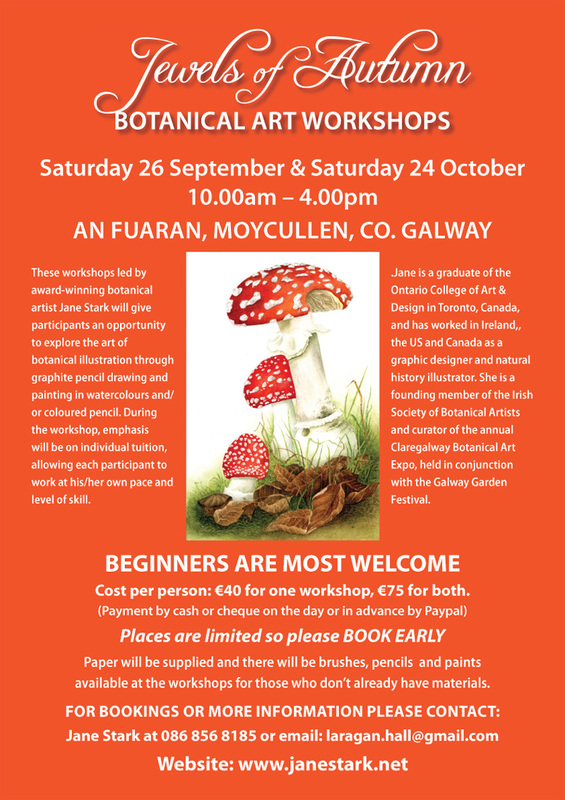 A few places are still available for these two botanical art workshops being held in Moycullen, County Galway on Saturday 26 September and Saturday 24 October 2015. Even if you are a complete beginner, you are very welcome to come along and spend the day (10.00am – 4.00pm) painting some special autumnal subjects, such as chestnuts, blackberries, coloured leaves etc. Cost for one workshop is €40 per person, or €75 for both workshops. September is almost here and botanical artists look forward to the wonderful autumn foliage, fruits and seed pods that provide endless possibilities for new paintings and drawings. It’s also the time of year when classes begin again after the summer break. I am looking forward to meeting new students as well as ‘veterans’ of previous courses. 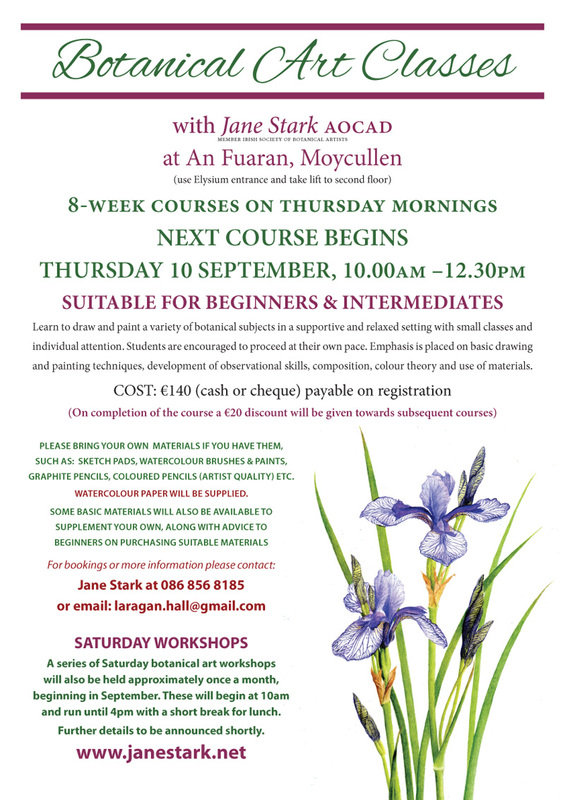 Thursday morning classes begin again on 10 September in An Fuaran, Moycullen, Co Galway, with the first course running until Thursday 29 October, inclusive. Another eight-week course will begin in mid-November. Details are on the poster, but if you have any questions, please don’t hesitate to contact me by phone or email. An eight-week course costs €140, but a €20 voucher towards the next course will be given to all students at the end of the course. Saturday workshops will also begin in September and will be scheduled roughly once a month. These have been extended by one hour and will run from 10am to 4pm with a short break for lunch. The price, however, remains the same as before: €40 for the day. Do remember to book early as places are limited. Plans are also underway for a number of informal workshops at Claregalway Castle during the autumn and winter, so watch this space for further information on those. 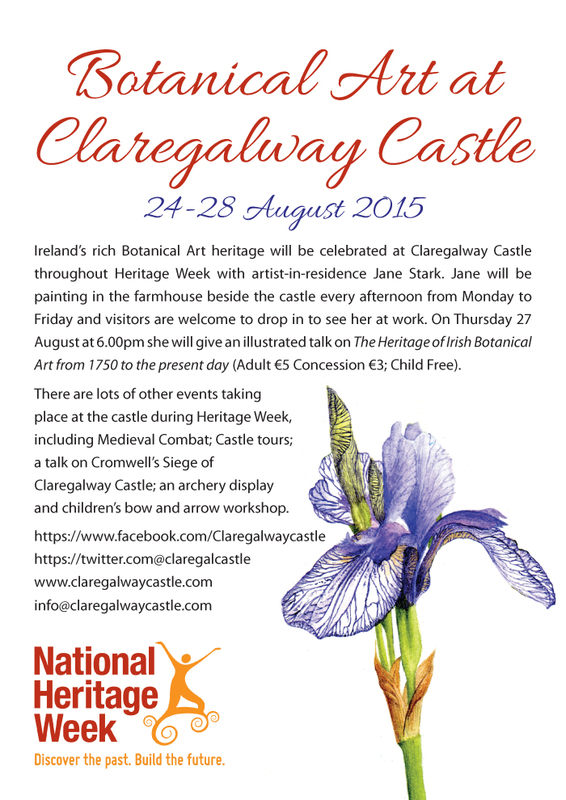 I’m delighted to be taking part in Heritage Week at Claregalway Castle this year. As botanical artist-in-residence, I will be working in the Farmhouse at the castle every afternoon (12.30 – 5.00) from Monday 24 – Friday 28 August inclusive. On Thursday 27 August, I am also giving a talk at 6.00pm in the lecture hall: Heritage of Irish Botanical Art from 1750 to the present. There is a small admission fee (€5: adult; €3: concession; child: free) for the talk, but there is no charge for visiting the Farmhouse to see my work in progress, as well as the exhibition of botanical paintings by several members of the Irish Society of Botanical Artists. If you are in the area, do drop by for a chat and a cup of tea. There will be some free handouts about botanical art, along with some beautiful botanical art books to browse through. Heritage Week will be celebrated in many different ways at Claregalway Castle and there is something for everyone. Dr Chris Doyle will be doing his fabulous tours of the castle every day during Heritage Week at 12.30, 1.30, 2.30 and 3.30 – no better way to learn more about the fascinating history of this sensitively restored castle. On Wednesday 26 August, Chris will also give a talk at 6.00pm about Cromwell’s siege of Claregalway Castle. If you are interested in medieval combat, there are demonstrations on Saturday the 22nd, along with archery displays and a children’s bow and arrow workshop. And the following weekend, Saturday 29 August. 6.00pm–10.30pm, there is a celebration of the life and work of Ciarán Bairéad (1905-76), and especially of his work as a folklore collector and recorder of Irish dialect in Claregalway, County Galway. 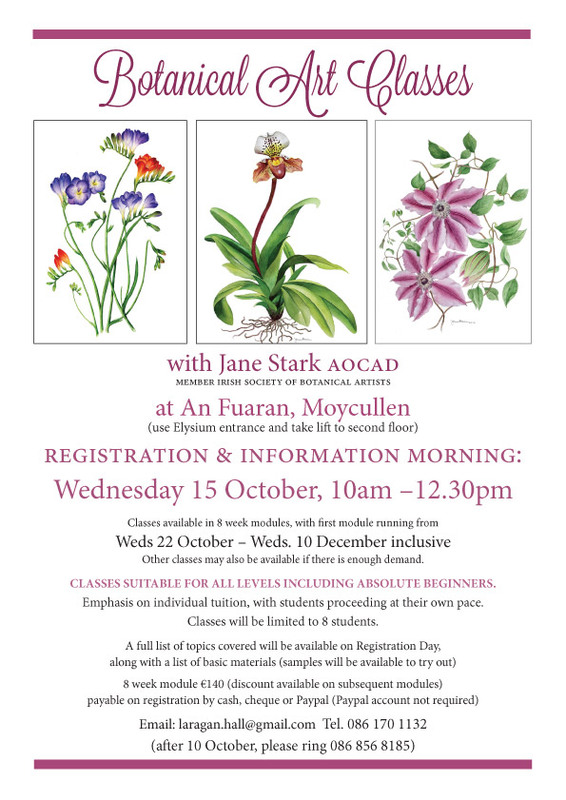 For anyone in the Galway/Moycullen/Barna/Oughterard area, I am starting botanical art classes on 23 October. The first eight week course will take place on Thurssday mornings from 10–12.30 (see image for details). Beginners are very welcome. Even if you are not sure whether this is for you, come along on the 15th to learn more. Please pass this on if you know anyone who might be interested. Only eight places per class are available so that students receive plenty of individual attention. There are just two places left for this module, but further classes and/or workshops at other times may become available if there is a demand for them. Please contact me at laragan.hall@gmail.com for further information.